Tour in English with English speaking guide. 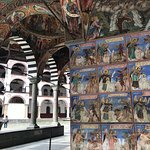 Join the tour with English speaking guide and visit the Rila Monastery at your own pace with an audio-guide in Spanish, Italian, Russian or German. 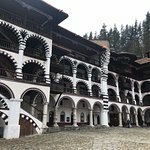 Join the tour with Spanish speaking guide and visit the Rila Monastery and Boyana church. This option is available every Thursday and Saturday. Lift your sights beyond Sofia to visit two of Bulgaria’s historical must-sees in one day—quite a feat to achieve independently. 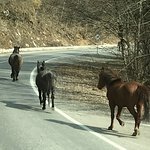 See Bulgaria’s countryside on a drive south, and tour the medieval Rila Monastery with a guide to do its history and treasures justice. 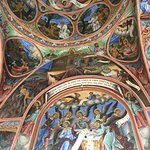 Then return to Sofia’s outskirts to visit and learn about fresco-filled Boyana Church. 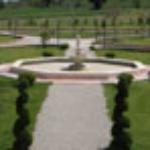 Lunch and entrance fees are at your expense, but all transportation is included. Greet your guide in central Sofia and see Bulgaria’s countryside, forests, and villages on a drive into the Rila Mountains. 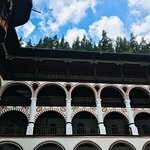 Here the remarkable UNESCO World Heritage–listed Rila Monastery—one of Bulgaria’s most famous Eastern Orthodox monasteries—sits on pine-coated slopes. Learn all about the legend-shrouded monastery, whose origins date to 927 AD, and enter (at your own expense) for a guided tour. Marvel at the fresco-covered colonnades, wooden icons, and tomb of Bulgaria’s last monarch, Boris III. 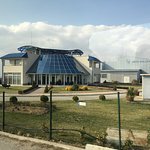 Opt to explore the monastery’s artifact-filled museum (own expense), and then enjoy free time for lunch at a local restaurant before journeying to the medieval Boyana Church, another UNESCO-listed site. Head inside (own expense) and view the well-preserved 10th-century frescoes that adorn the interior. Admire the depictions of angels, apostles, and sinners, and hear the full background on their painting, styles, and significance. Finally, end your tour with a convenient drop-off in central Sofia. Monestery so so, but the Ousarry is incredible. 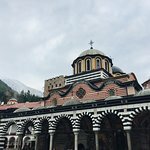 Get quick answers from Rila Monastery and Boyana Church Day Trip from Sofia staff and past visitors. They tell you on the ticket. 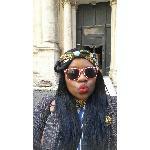 It's just by La Cattedrale restaurant, behind St Alexander Nevski Cathedral. If you look it up on Google Maps they've actually pinned the location they pick you from. There's usually more than one company parked there, so look for the Traventuria minivans. Can we have a two person trip?